So I finally caved in and took a few pictures, and had fun photoshopping them. This one turned out the "best" and it's making its rounds. 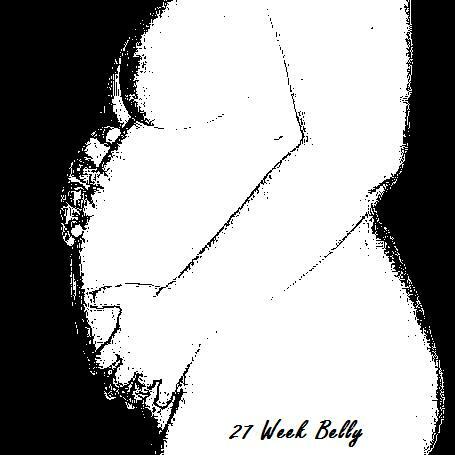 At 27 weeks... I can feel a lot of motion. I have been for awhile now. Jake is a VERY active little boy. Some days he'll pick one random spot, and just kick the hell out of it until I think his foot is about to break through. Other days he doesn't kick, he just flips... and flips... and flips... and squirms... and flips... and I can feel his body parts all moving and poking out at random spots... and his arm, which was just down by my hips, is now poking into my ribs! It's the coolest feeling (unless it's at 3am)! And of course, we all know Daddy loves it.